Lahore (Monday, December 2, 2013) – Lahore MotorWay City is a project of Green View Co-operative Housing Society Limited. It is being financed and developed by Renaissance Group, Renaissance International Private Limited. Its master plan and scheme has been approved by Tehsil Municipal Administration Sheikhupura vide letter No. TMA/F/8-658. 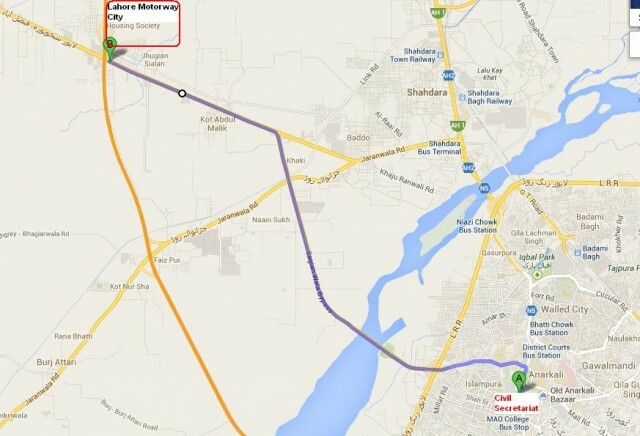 Lahore Motorway City lies at the distance of 14 Kilometers from Punjab Civil Secretariat Lahore via Lower Mall Road, Nasir bagh, Out Fall Road, Sagian Bridge and Lahore -Sheikhupura Express Way. Dear Taqi Sahib, how can this scheme be approved by LDA, because it’s situated in Sheikhupura, not in Lahore. ?? Further can you provide us the Joint venture agreement copy between Green view Co-operative society and Renaissance group (who is developing this land.) ? What is guarantee that management will not run away after collection of funds from general public ? Can anybody answer these questions. Director (Metropolitan Planning), CMP Wing said except LDA no other authority or Town Municipal Administration/Tehsil Municipal Administration or any local body or any other government agency is authorised to approve any private housing scheme/land sub-divisions in Lahore Division after 19.09.2013. “Any approval granted by any other authority or Town Municipal Administration/ Tehsil Municipal Administration or any local body or any other government agency in Lahore Division, after 19.09.2013, will not be valid and lawful,” he said, adding sponsors of housing schemes and land sub-divisions are not allowed to develop the scheme without approval of LDA.